IF the virtue of children reflects an honor on their parents, much more justly is the name of St. Patrick rendered illustrious by the innumerable lights of sanctity with which the Church of Ireland shone during many ages, and by the colonies of Saints with which it peopled many foreign countries; for, under God, its inhabitants derived from their glorious apostle the streams of that eminent sanctity by which they were long conspicuous to the whole world. St. Patrick was born towards the close of the fourth century, in a village called Bonaven Taberniæ, which seems to be the town of Kilpatrick, on the mouth of the river Clyde, in Scotland, between Dumbarton and Glasgow. He calls himself both a Briton and a Roman, or of a mixed extraction, and says his father was of a good family named Calphurnius, and a denizen of a neighboring city of the Romans, who not long after abandoned Britain, in 409. Some writers call his mother Conchessa, and say she was niece to St. Martin of Tours. In his sixteenth year he was carried into captivity by certain barbarians, who took him into Ireland, where he was obliged to keep cattle on the mountains and in the forests, in hunger and nakedness, amidst snow, rain, and ice. Whilst he lived in this suffering condition, God had pity on his soul, and quickened him to a sense of his duty by the impulse of a strong interior grace. The young man had recourse to Him with his whole heart in fervent prayer and fasting; and from that time faith and the love of God acquired continually new strength in his tender soul. After six months spent in slavery under the same master, St. Patrick was admonished by God in a dream to return to his own country, and informed that a ship was then ready to sail thither. He went at once to the sea-coast, though at a great distance, and found the vessel; but could not obtain his passage, probably for want of money. The Saint returned towards his hut, praying as he went; but the sailors, though pagans, called him back and took him on board. After three days’ sail they made land, but wandered twenty-seven days through deserts, and were a long while distressed for want of provisions, finding nothing to eat. Patrick had often spoken to the company on the infinite power of God; they therefore asked him why he did not pray for relief. Animated by a strong faith, he assured them that if they would address themselves with their whole hearts to the true God He would hear and succor them. They did so, and on the same day met with a herd of swine. From that time provisions never failed them, till on the twenty-seventh day they came into a country that was cultivated and inhabited. Some years afterwards he was again led captive, but recovered his liberty after two months. When he was at home with his parents, God manifested to him, by divers visions, that He destined him to the great work of the conversion of Ireland. The writers of his life say that after his second captivity he travelled into Gaul and Italy, and saw St. Martin, St. Germanus of Auxerre, and Pope Celestine, and that he received his mission and the apostolical benediction from this Pope, who died in 432. It is certain that he spent many years in preparing himself for his sacred calling. Great opposition was made against his episcopal consecration and mission, both by his own relatives and by the clergy. These made him great offers in order to detain him among them, and endeavored to affright him by exaggerating the dangers to which he exposed himself amidst the enemies of the Romans and Britons, who did not know God. All these temptations threw the Saint into great perplexities; but the Lord, Whose will he consulted by earnest prayer, supported him, and he persevered in his resolution. He forsook his family, sold his birthright and dignity, to serve strangers, and consecrated his soul to God, to carry His name to the ends of the earth. In this disposition he passed into Ireland, to preach the Gospel, where the worship of idols still generally reigned. He devoted himself entirely to the salvation of these barbarians. He travelled over the whole island, penetrating into the remotest corners, and such was the fruit of his preachings and sufferings that he baptized an infinite number of people. He ordained everywhere clergymen, induced women to live in holy widowhood and continence, consecrated virgins to Christ, and instituted monks. He took nothing from the many thousands whom he baptized, and often gave back the little presents which some laid on the altar, choosing rather to mortify the fervent than to scandalize the weak or the infidels. He gave freely of his own, however, both to pagans and Christians, distributed large alms to the poor in the provinces where he passed, made presents to the kings, judging that necessary for the progress of the Gospel, and maintained and educated many children, whom he trained up to serve at the altar. The happy success of his labors cost him many persecutions. A certain prince named Corotick, a Christian in name only, disturbed the peace of his flock. This tyrant, having made a descent into Ireland, plundered the country where St. Patrick had been just conferring confirmation on a great number of neophytes, who were yet in their white garments after Baptism. Corotick massacred many, and carried away others, whom he sold to the infidel Picts or Scots. The next day the Saint sent the barbarian a letter entreating him to restore the Christian captives, and at least part of the booty he had taken, that the poor people might not perish for want, but was only answered by railleries. The Saint, therefore, wrote with his own hand a letter. In it he styles himself a sinner and an ignorant man; he declares, nevertheless, that he is established Bishop of Ireland, and pronounces Corotick and the other parricides and accomplices separated from him and from Jesus Christ, Whose place he holds, forbidding any to eat with them, or to receive their alms, till they should have satisfied God by the tears of sincere penance, and restored the servants of Jesus Christ to their liberty. This letter expresses his most tender love for his flock, and his grief for those who had been slain, yet mingled with joy because they reign with the prophets, apostles, and martyrs. Jocelin assures us that Corotick was overtaken by the divine vengeance. 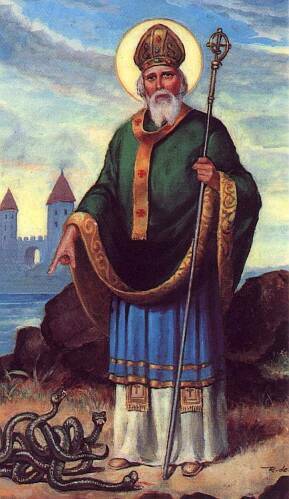 St. Patrick held several councils to settle the discipline of the Church which he had planted. St. Bernard and the tradition of the country testify that St. Patrick fixed his metropolitan see at Armagh. He established some other bishops, as appears by his Council and other monuments. He not only converted the whole country by his preaching and wonderful miracles, but also cultivated this vineyard with so fruitful a benediction and increase from heaven as to render Ireland a most flourishing garden in the Church of God, and a country of Saints. Many particulars are related of the labors of St. Patrick, which we pass over. In the first year of his mission he attempted to preach Christ in the general assembly of the kings and states of all Ireland, held yearly at Tara, the residence of the chief king, styled the monarch of the whole island, and the principal seat of the Druids, or priests, and their paganish rites. The son of Neill, the chief monarch, declared himself against the preacher; however, Patrick converted several, and, on his road to that place, the father of St. Benignus, his immediate successor in the see of Armagh. He afterwards converted and baptized the Icings of Dublin and Munster, and the seven sons of the king of Connaught, with the greatest part of their subjects, and before his death almost the whole island. He founded a monastery at Armagh; another called Domnach-Padraig, or Patrick’s Church; also a third, named Sabhal-Padraig; and filled the country with churches and schools of piety and learning, the reputation of which, for the three succeeding centuries, drew many foreigners into Ireland. He died and was buried at Down in Ulster. His body was found there in a church of his name in 1185, and translated to another part of the same church. Ireland is the nursery whence St. Patrick sent forth his missionaries and teachers. Glastonbury and Lindisfarne, Ripon and Malmesbury, bear testimony to the labors of Irish priests and bishops for the conversion of England. Iona is to this day the most venerated spot in Scotland. Columban, Fiacre, Gall, and many others evangelized the “rough places” of France and Switzerland. America and Australia, in modern times, owe their Christianity to the faith and zeal of the sons and daughters of St. Patrick. Reflection.—By the instrumentality of St. Patrick, ask God to obtain for you the special grace of preferring the loss of every earthly good to the least compromise in matters of faith.